Owing to the increase in geriatric population and rise in cardiovascular diseases, the global telehealth market is anticipated to witness a rapid growth rate. The competitive landscape of the market is highly fragmented regarding the number of players who provide services like hardware and software. Due to the increase in the number of chronic diseases like asthma, cancer and diabetes, there is the flow of demand for self-care solutions or devices. This is accompanied by the advancement in technology in terms of mobile health care and medical imaging which further boosts the telehealth market globally. There are a number of factors contributing to the growth of the telehealth market like the information and communication technology or ICT, advancement in mobile perforation, and connectivity. Since mobile access is pervasive all around the globe, it is easier for the telehealth market to prevail with time. There is rise in remote monitoring solution adoption by patients in rural areas may also add to the growth of the telehealth market globally. The telehealth market can also be expected to draw a large share of revenue owing to factors like effective image transfer, consistent evolution in communication and information technologies, and reporting and consultation. Adding to that, the scarce population of radiologists present around the world may also add to the increase in the overall growth of the telehealth market globally. The global telehealth market is anticipated to expand at a CAGR of 13.0% within the forecast period of 2017 to 2025. Previously the market was valued at US$ 6.0 bn as of the 2016 records. The rising number of chronic diseases and their concern is presumed to expand the growth of the global telehealth market during the forecast period. The global telehealth market is segmented on the basis of component, where the key classifications are services, software and hardware. The software segment is further classified into standalone software and integrated software. The services segment is further categorized into remote monitoring, store and forward, and real-time services. On the basis of application, the global telehealth market is classified as dermatology, psychiatry, remote intensive care unit or remote ICU, urgent care, cardiology and radiology. Cardiology, of all, seems to attract more revenue into the market and is anticipated to be the key application of telehealth. Increase in cardiovascular diseases and more heart diseases like strokes and attacks may account for almost about 19 percent share contribution to the telehealth market in the years to come. The end-user category is further segmented into patients, providers and payers. Among these, the payers segment is expected to expand with CAGR during 2017 to 2025. This is because of the rising adoption of connected medical and telehealth devices provided by insurance companies for claiming their insurance management. The global telehealth market is studied on the basis of key geographies Middle East and Africa, Latin America, Asia Pacific, Europe and North America. With regard to revenue, North America is seen to be having the dominance over the market all around the globe in the forecast period. This is due to the government initiatives taken in order to enlarge the adoption of telehealth services. So, North America is anticipated to continue its dominance over the telehealth market in the future years as well. The market is Asia Pacific is also presumed to expand at a notable CAGR rate during the forecast period. This due to the large number of patients who suffer from chronic diseases along with the aging population and also the heavy demand for improving the health infrastructure and cutting down health care expenditure, in developing nations of Australia, China, and India. Some of the key players in the global telehealth market are American Well, Honeywell International, Inc., Royal Philips, Aerotel Medical Systems Ltd., and Medtronic. This report studies the current as well as future prospects of the global telehealth market. Stakeholders of this report include companies and intermediaries engaged in the manufacture and commercialization of various telehealth products, software, and services as well as new players planning to enter this market. This report comprises an elaborate executive summary along with a market snapshot providing overall information of various segments and sub-segments considered within the scope of the study. 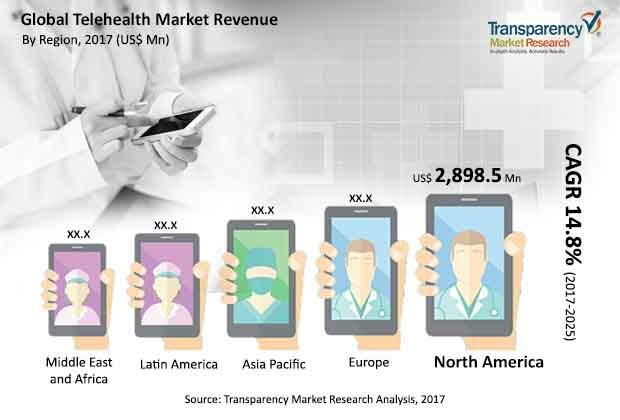 This section also provides the overall information and data analysis of the global telehealth market with respect to the leading market segments based on major components, significant applications, key end-users, and regions. The telehealth market report comprises an elaborate executive summary, which includes a market snapshot that provides information about various segments of the market. It also provides information and data analysis of the global market with respect to the segments based on component, application, end-user, and region. A detailed qualitative analysis of drivers and restraints of the market and opportunities has been provided in the market overview section. Additionally, the section comprises competitive matrix and company profiles with business overview to understand the competitive landscape in the market. This section of the report also provides market attractiveness analysis by region and market share analysis by key players, thereby presenting a thorough analysis of the overall competitive scenario in the global telehealth market. Based on component, the global telehealth market has been segmented into hardware, software and services. The software segment has been bifurcated into integrated and standalone. The services segment has been divided into real-time, store & forward, remote monitoring, and others. The market size and forecast for each of these sub-segment have been provided for the period from 2015 to 2025, along with their respective CAGRs for the forecast period from 2017 to 2025, considering 2016 as the base year. In terms of application, the global telehealth market has been segmented into radiology, cardiology, urgent care, remote ICU, psychiatry, dermatology, and others. Increasing research and development in mobile medical imaging systems and it’s allow patients to take diagnostic images from smartphone and share it with the physician. This factor is responsible for the continuing dominance of the sub-segment.The market size and forecast for each of these sub-segment have been provided for the period from 2015 to 2025, along with their respective CAGRs for the forecast period from 2017 to 2025, considering 2016 as the base year. Based on end-user, the global telehealth market has been classified into payers, providers, patients, and others. Increase in adoption of technologically advanced products and advantages of heart rate monitors such as provision of real-time health data, thereby allowing patients to track heart rate from anywhere anytime and consult with doctors/physicians in case of emergency through there smartphones are projected to boost the growth of the telehealth market during the forecast period. The market size and forecast for each of these sub-segment have been provided for the period from 2015 to 2025, along with their respective CAGRs for the forecast period from 2017 to 2025, considering 2016 as the base year. Geographically, the global telehealth market has been segmented into five major regions and key countries in respective region: North America (U.S., Canada), Europe (U.K., Germany, France, Spain, Italy, and Rest of Europe), Asia Pacific (India, China, Japan, Australia & New Zealand, and Rest of Asia Pacific), Latin America (Brazil, Mexico, and Rest of Latin America), and Middle East & Africa (South Africa, GCC Countries, Israel, and Rest of Middle East & Africa). The market size and forecast for each of these regions and the mentioned countries have been provided for the period from 2015 to 2025, along with their respective CAGRs for the forecast period from 2017 to 2025, considering 2016 as the base year. The research study also covers the competitive scenario in these regions. The report also profiles major players in the global telehealth market based on various attributes such as company overview, financial overview, product portfolio, business strategies, and recent developments. The major players in this market are Teladoc, Inc., American Well, BioTelemetry, Inc., Medtronic, Aerotel Medical Systems Ltd., InTouch Technologies, Inc., Koninklijke Philips N.V., Honeywell International, Inc., GE Healthcare, and AMD Global Telemedicine, Inc.